For 30 years, Royal Rumble has been a stepping stone for superstars to rise to legendary status by getting the chance to headline WrestleMania. Which superstar from Raw or SmackDown will take their career to the next level? “The Phenomenal” AJ Styles and John Cena write the next chapter in their historic rivalry in a match for the WWE World Championship. WWE Universal Champion Kevin Owens faces challenger Roman Reigns with Kevin Owens’ best friend suspended high above the ring in a shark cage! And WWE Women’s Champion Charlotte Flair looks to extend her famed Pay-Per-View winning streak against Bayley! Buckle up, because we are now on The Road To WrestleMania! Royal Rumble kicks off every year with a huge bang. It’s arguably the most anticipated night in the WWE calendar, as fans wait for the thrills and surprises of the Royal Rumble match - not to mention finding out who will go on to main event WrestleMania! Royal Rumble 2017 is particularly historic, returning to San Antonio’s huge Alamodome - the very building where Shawn Michaels became WWE Champion and Stone Cold Steve Austin won his very first Royal Rumble 20 years earlier. And the action more than lives up to the scale and significance of the event. John Cena and AJ Styles dazzle once again in an electric match, the final chapter in what will be remembered as one of the all-time great rivalries. There’s a hard-hitting brawl between Universal Champion Kevin Owens and Roman Reigns, who put their bodies on the line in a vicious No Disqualification match - and you won’t believe the shock ending! There’s more thrilling action in the Raw Women’s Championship and Cruiserweight Championship matches, plus the Royal Rumble itself - one of the greatest Rumble matches in the event’s illustrious history. With surprise entries, shocking eliminations and earth-shattering collisions between WWE’s biggest superstars, this is one not to be missed! 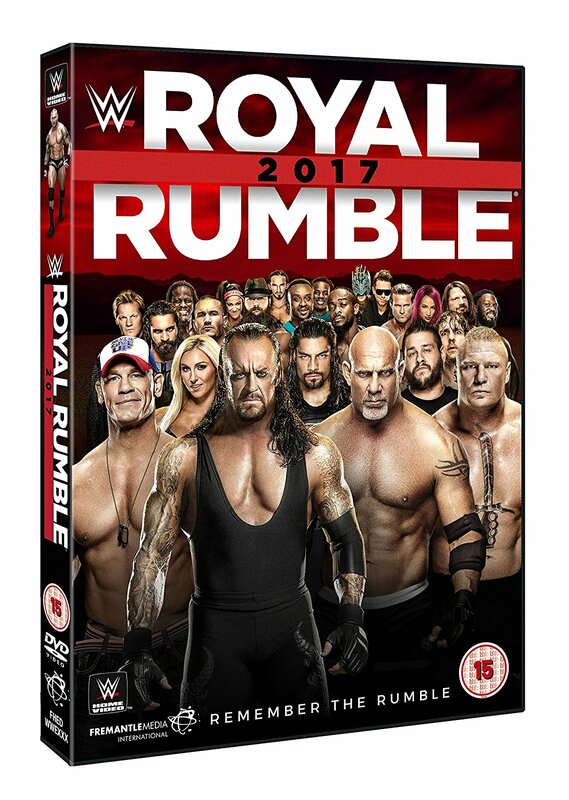 Royal Rumble 2017 will officially be released on DVD and Blu-ray on Monday March 20 2017.